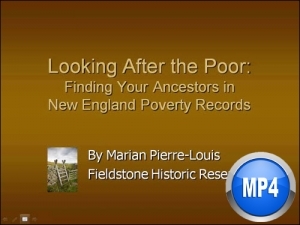 Discover how your not-so-wealthy New England ancestors may have left behind a wealth of information found in town poverty records. Come find out about “strangers taken in” records, “warning out” records and settlement law. Discover who cared for the town poor before state or national welfare benefits. You will be surprised at the level of detail you can find about your ancestors. Marian Pierre-Louis will take you into the depths of New England town records to reveal the hard to find information about your elusive ancestors. 52 minutes, plus 4 pages of handouts. The recording is also included as part of the�monthly�or�annual�membership.